Making these Cheesy Keto Breadsticks is going to make sticking to the keto lifestyle so much easier! One of the hardest things to give up on the keto diet is bread, but you don’t have to worry anymore! These easy low carb cheese breadsticks are going to change everything in your meal plan! One thing I miss the most since we started Keto is bread. 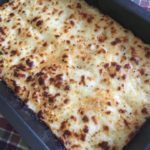 After posting my Keto Biscuit, Keto Sausage Ball Puffs, and Keto Chicken Pot Pie recipe I thought that surely I could make some adjustments to create a cheesy keto breadstick recipe. Now, let me set the expectation. These will not taste EXACTLY like cheese sticks from your favorite Italian Restaurant since there is no gluten in coconut flour and the texture is different. However, they are an excellent keto/low carb alternative that will hit the spot. Note: I’ve had many people ask if you can sub out almond flour for any of my recipes that contain coconut flour. Just to let you know up front, I am sure you could. However, my daughter is allergic to almonds, so I don’t personally have any experience cooking with almond flour. It is not a 1:1 substitution as coconut flour is more absorbent. 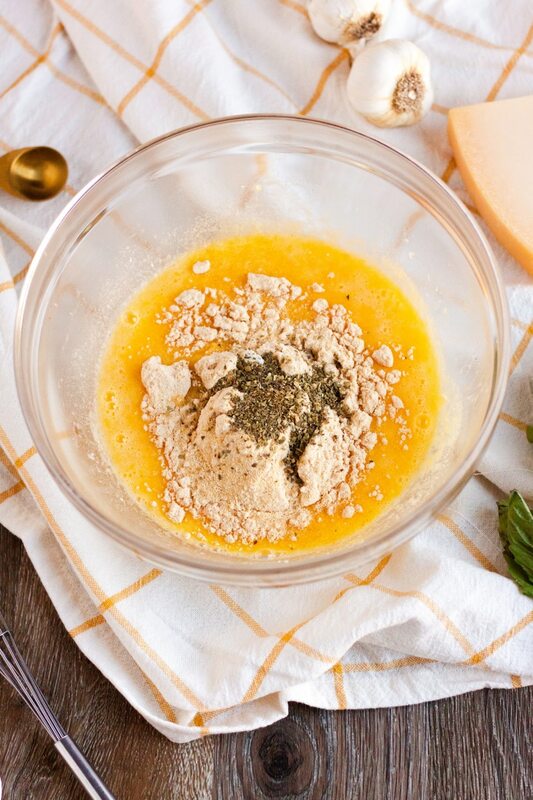 Generally, a great place to start is using 4x as much almond flour as coconut flour. Cheesy Keto Breadsticks are super easy to make. 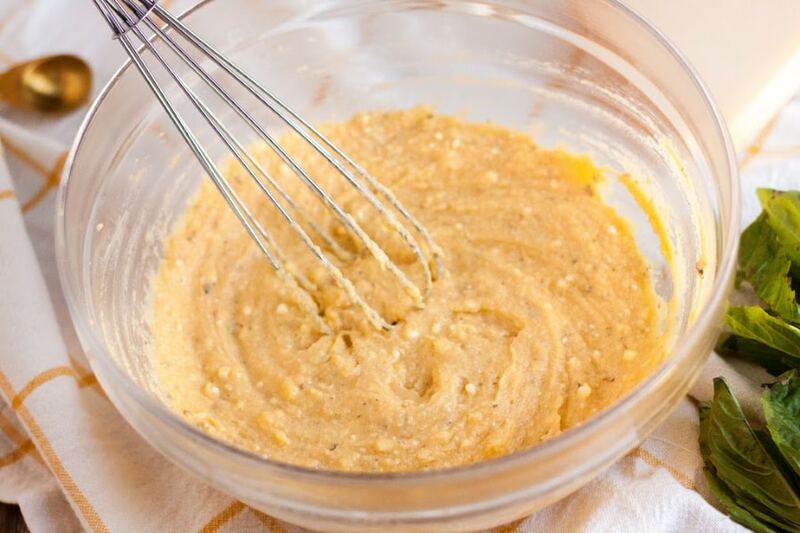 Once your batter is all mixed up pour it into the pan. Of course, you’ve got to add extra cheese on top to make them cheesy keto breadsticks, right? Yum! Doesn’t they look amazing? 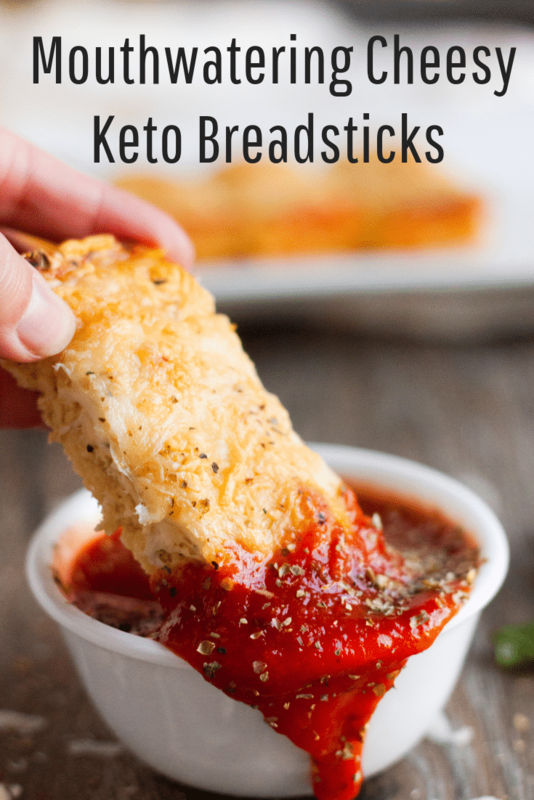 While we don’t eat these Cheesy Keto Breadsticks often, they are a nice treat every now and then. 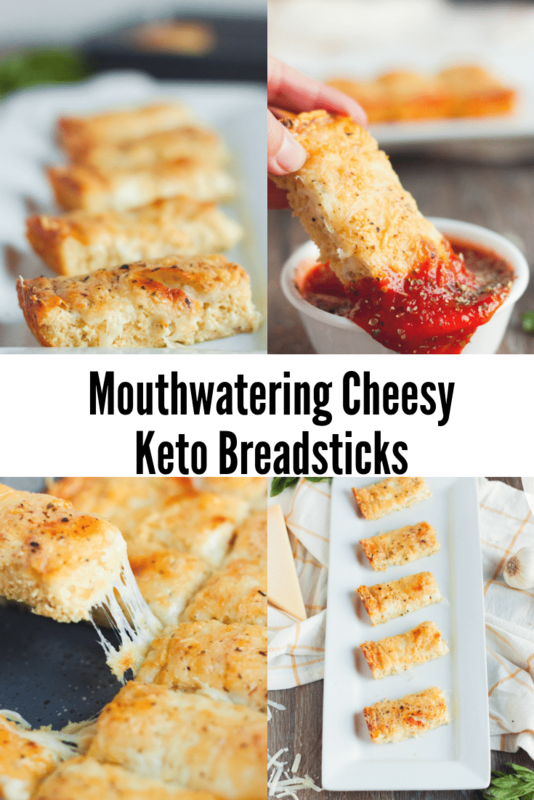 Making these Cheesy Keto Breadsticks is going to make sticking to the keto lifestyle so much easier! One of the hardest things to give up on the keto diet is bread, but you don't have to worry anymore! 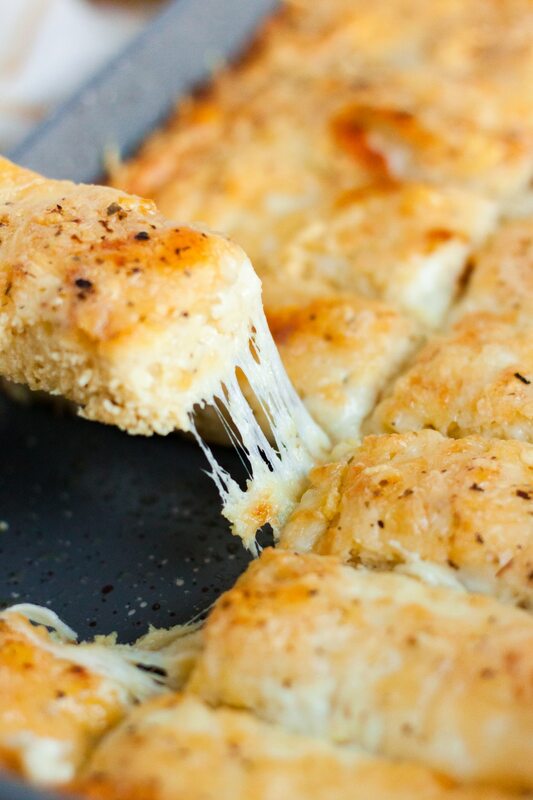 These easy low carb cheese breadsticks are going to change everything in your meal plan! Preheat oven to 400 degrees and grease an 11X7 baking pan. 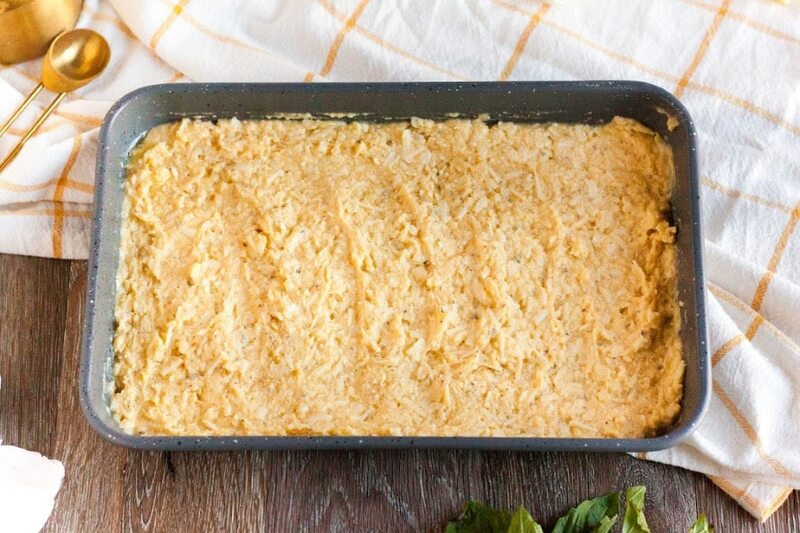 Pour batter into rectangular casserole dish. Top bread mixture with the additional mozzarella, parmesan cheese, and Italian spices. Halfway through baking use a pizza cutter to cut horizontally down the middle then vertically every inch or so to create a division in the individual breadsticks. I cut mine into 16 half breadsticks. Bake for 15 minutes or until breadsticks are done. 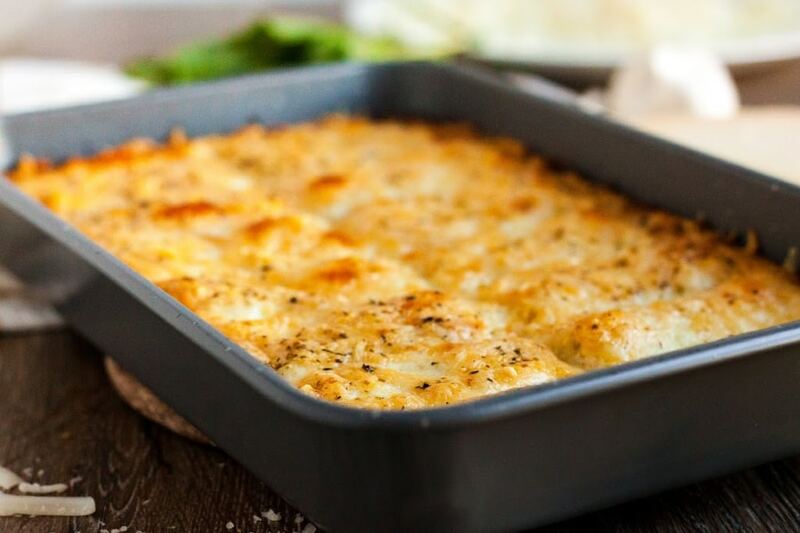 Move pan to top rack of the oven and broil for 1-2 minutes so that the cheese is browned and bubbly. Serve with low sugar Marinara Sauce. I love serving up these keto breadsticks with just a bit of homemade marinara. You can also add these as a side to my Italian Meatball casserole or Lazy Chicken Parmesan with a low carb marinara sauce. 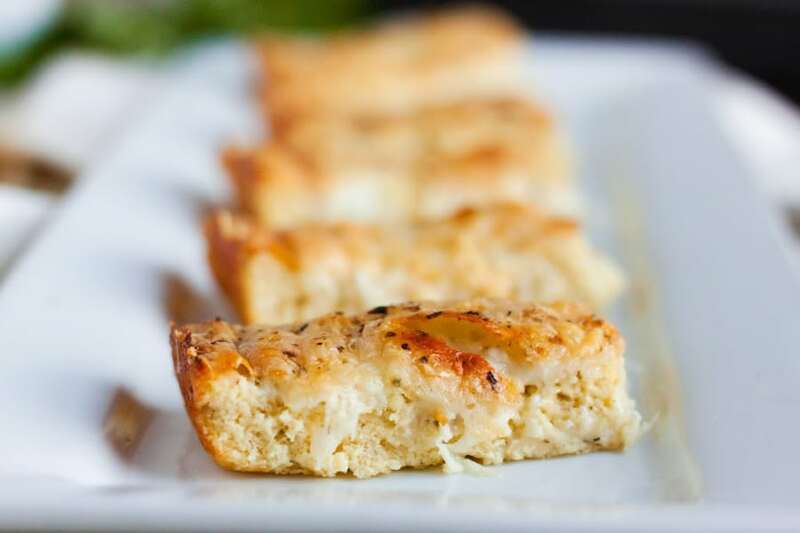 While these cheesy keto breadsticks are best right out of the oven, you may also want to make larger batches to reheat later. First, allow to cool, then place in freezer bags or freezer containers, and they keep well in the freezer for up to 3 months. They are great in the refrigerator for several days after baking. For more easy Keto recipes, check out my Keto Recipe Index. Thank you for the coconut flour recipes!! And the honesty to say the recipe will NOT taste exactly like it’s wheat flour counterpart. Because it won’t taste, feel, bake, etc. But, you’re right, it will hit the spot! Again, thank you! Finding your site this morning is like a breath of fresh air in the grain free world!! Oh, Laurie I’m so glad you commented. I’ve read so many recipes that say cauliflower tastes just like mashed potatoes and pizza. It’s NOT true! It may be a good substitute but it’s not as good and definitely not better. I had to be honest. lol!! Thanks Kasey. I followed your directions to the letter and they turned out perfectly. It worked out to two tablespoons of batter to each cup for my batch of twelve. I had to run to store to get new baking powder, mine expired in 2011. I am going to freeze them and have a nice treat readymade in the mornings. I wanted to send picture but haven’t learned how to do that. I took one if I learn how to send it, I will. Sounds great! I’m so glad you enjoyed them. Hmmmmm…..that is very weird. I don’t have any idea why that would happen. Did you use coconut flour? Oh. My. YUM! Thank you! Great recipe! I added pepperoni. Will make this again. These are to die for!!!! Me and my husband are starting to eat better and get healthy and it seems keto is the best way to go. I had a stomach surgery a while back, and he can’t eat wheat….so this fits us perfectly, and with all your recipes, makes it soooo much better and easier. I did have to tweak the recipe just a bit and put crumbled bacon in it tho…you should try it. Thanks again for all the awesome recipes, ESPECIALLY this one! Hello, I forgot to buy Parmesan, do you think I could sub with more of the other cheeses? Im curious, why do they need to be cut in the middle of baking? It makes them easier to cut when they are done and kind of creates a crisp like edge. These are very good, and I agree they aren’t the same but a good sub! Will be saving this one. like potatoes and uh.. No way they are definitely not. :0) Lol. What would be the measurement for regular flour? I’m not sure. I’ve never tested this recipe with regular flour, although coconut flour and regular flour are not 1:1 substitutions. I was searching for a recipe for cheese breadsticks… With what I already have in the kitchen. I taste tested with my family and they loved them just as much as I do! Its amazing when you can share your diet foods with your family and everyone is happy!! Kasey, you have some amazing recipes. Thank you for making the keto life so much easier for me. Can’t wait to try these. Thank you so very much, Sandra! I so appreciate your kind words! Hi – had trouble with the cheesy breadstick recipe – cooking time. It states to remove 1/2 way thru baking to pre-cut the sticks. At what time in baking is that to be done 7.5mins? That did not work – it was still slop at that stage. At 15mins baking time I recut the strips. They were not done yet. Baked a further 15mins to make sure that they were cooked thru. Pls clarify cooking time – 15mins total does not seem to do the job. In my oven, 15 minutes worked just fine. But, all ovens cook differently. This worked out delicious. I had them along with the Cheeseburger Soup from this website. I only had 3 tbsp of butter but they came out perfect. Also I don’t have a pizza cutter so I just cut them in the end. I wonder if they’ll work with almond flour? Awesome! You will need 4x as much almond flour as almond flour isn’t a 1:1 sub? For clarification, calories are 299 for one breadstick and the recipe makes 8, correct? Do you have a recipe for homemade marinara sauce? These breadsticks are awesome! And your Italian Meatball Casserole is one of our favorite recipes!! Thank you for your simple recipes and meal plans from a fellow busy homeschool mom! I don’t have a homemade marinara sauce. I typically use Rao’s or Mezzetta. Both have the same carb count and can be found at Walmart. Absolutely hands down, is the best thing I’ve tasted in a very long time! Other receipes are just a substitute cheese bread. This is the real deal!!!? Fantastic! I’m so glad it it the spot. Dominos makes a bacon jalapeno stuffed cheese bread that is amazing! But NOT keto friendly!! I’m going to make these and see how they compare!!! I bet it’ll hit the spot!!! I’ll let ya know!! Thanks for your awesome recipes!!! Hope it turned out good!! Very good! I added chopped fresh garlic on top! Perfect! So glad you enjoyed them. I made the Sausage puffs an they are wonderful. I am starting the Keto Diet and this was my first recipe to try and was really good! I am new to experimenting with almond and coconut flour. I can taste a hint of coconut which is not bad as I love coconut flavor but I see the comment on the conversion for almond to coconut flour. Since this is 1/3 cup, how much almond flour would I need? I have been trying to google it and found no luck. Yum! The whole family loved these. I made them alongside meatballs and it was such a good meal. Thanks! Perfect! So glad you loved it! Hello, I’d like to substitute the coconut flour for almond flour. How much almond flour should I add for this recipe? Thanks in advance! You would need 4x as much. This was a big hit in my home. My son is a type 1 diabetic, but he doesn’t normally like low carb versions of recipes. He loved it though. I had to cook them for 23 minutes, though, instead of the suggested 15. Thank you for sharing! My oldest daughter and hubby are also type 1 as well. So glad you all enjoyed it. Every oven does cook differently. Yes, but you’ll need 4x as much. 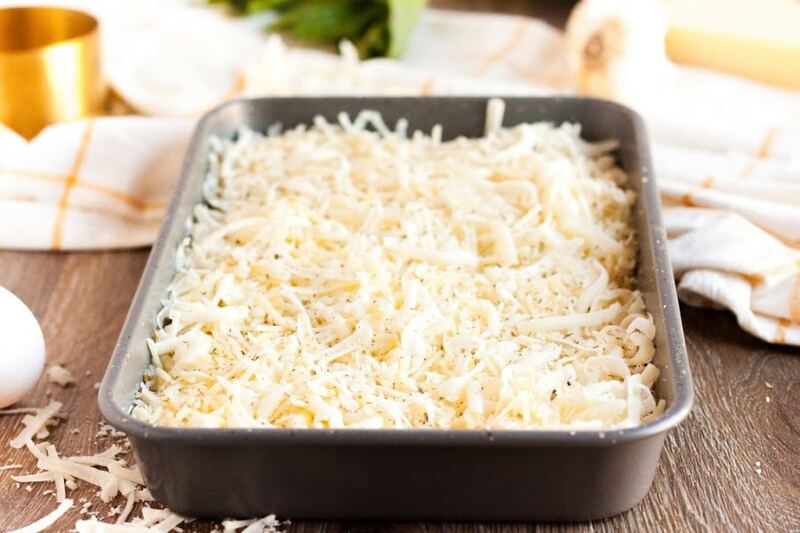 Do you have a recipe that doesn’t use so much cheese? I live in ,New Zealand and cheese is expensive. Can gluten free flour such as bobs red mill be used in this? I’ve only tested the recipe as is I am not familiar with gluten-free flour. However, the sub for coconut flour to regular flour is 1:4. I would think you would have to use 4x as much of the gluten-free flour as well but I’m not certain. Hey Chontell, the nutritional info is per breadstick. I don’t know I haven’t tried freezing the dough first. Hello. Im new-ish to keto lifestyle (about 2 months) and in finding your recipes, I feel like I hit the jackpot!! The recipes I’ve made so far turned out amazing. I love the simplicity and not 1million uncommon ingredients in each recipe. Thank you so much for your hard work and inspiration!! Hey, Tonia glad you are enjoying! !